Not quite Arrested Development, really, is it? Ever wanted to channel your inner Jack Donaghy? 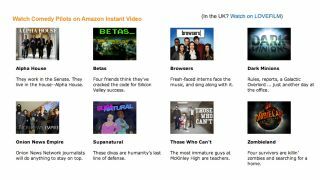 You can now play at show-runner by watching Amazon's eight comedy pilots on Amazon Instant Video or Lovefilm and telling Amazon which it should pursue by awarding each a star rating. At the moment, Zombieland looks to be ahead in the race, but we can neither confirm nor deny that the feedback form begins GOOD GOD LEMON. Other bite-sized things have happened in tech - including a murder that turned out to be a swimming dog. What next? Find out here. Microsoft to renew Heroes TV show for Xbox?